I had always wanted to see it for myself. 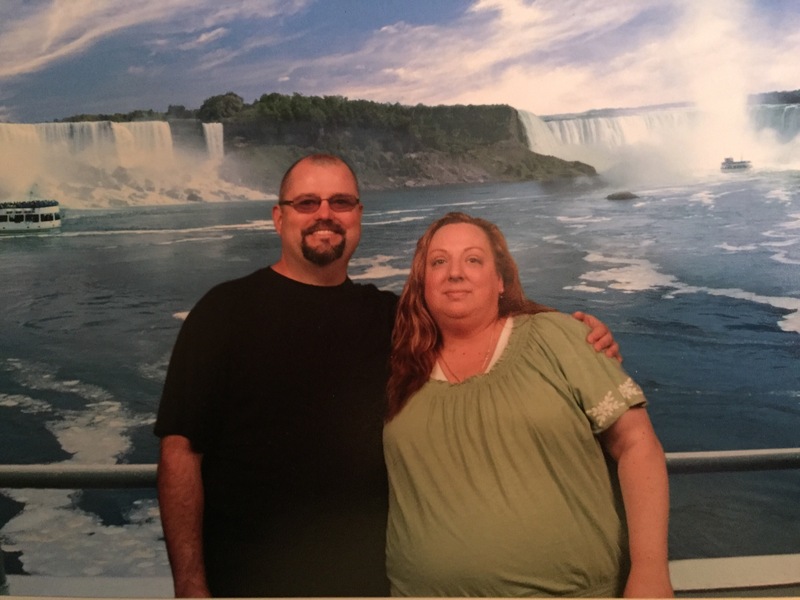 Several years ago, while visiting the East Coast and getting ready to leave Baltimore, we found that on our way to Philadelphia we still had three days before we were expected at a family get together. So we sat in the parking lot of the Civil War Memorial near Antietam Maryland and tried to decide where we would go. The Captain and I have long since practiced a little something we call accidental tourism, where we will just randomly pick a direction or destination and head out without so much as a reservation and the fervent hope of seeing where the adventure will take us. So we started looking at the map and trying to decide which direction we would head. And there I was, waiting for some kind of sign from the universe, when a delivery truck drove by with the logo for Tim Hortons donuts emblazoned on the side. It was like that moment when the clouds part, and a ray of sunshine breaks through to a chorus of euphoric accolades. What? We love Tim Hortons! I did not even know that they had stores in the US, I thought they only had them in Canada! Living in Washington State, we were frequent visitors to Vancouver B.C on the western side of Canada, and sometimes we would even go across the border just for a coffee and donut run. Lemon crullers for me and apple fritters for The Captain. And then, we always got a box of assorted TimBits donut holes with a few extra cherry chip ones for the road. This might be a game changer. I started feverishly looking on my phone for the nearest Tim Hortons, and found that in upstate New York they had one in Buffalo. It was decided. We would be heading north. I looked at the map. I had wanted to see the eastern side of Canada, and I had always heard about how beautiful upstate New York was. And then I spotted it. Right there on the border… Niagara Falls. And as it so happens, that one was on my bucket list. So, I could kill two birds with one stone, I thought. I could see the majestic falls AND eat donuts?? I could eat donuts while looking at the falls! I could fall asleep listening to the sound of the falls with my belly full of donuts? I had visions of running and skipping with reckless abandon through the dewy cast off spray from this wonder of nature, and laughing aloud with my coveted bag of donuts. I started to get very excited about our little upcoming adventure. 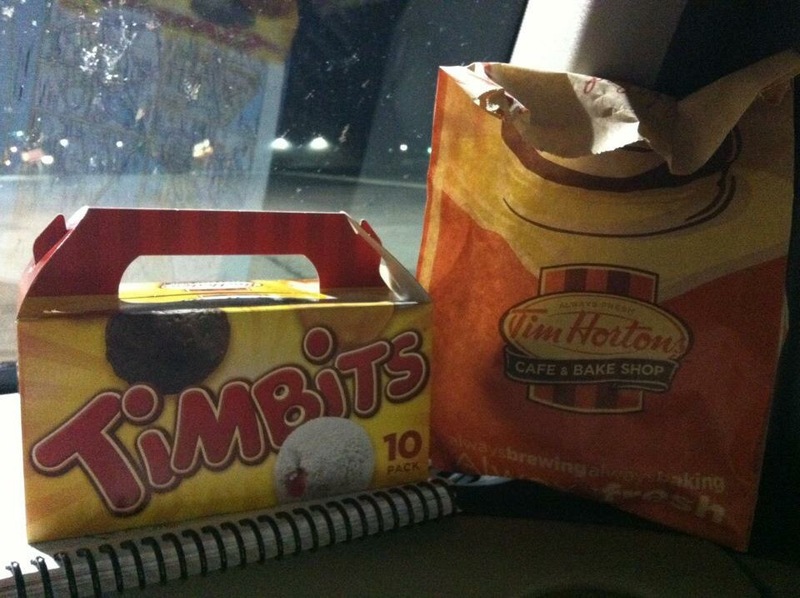 Tim Hortons…err, um Niagara Falls here we come! It was one of my favorite parts of going to Canada. My favorite thing about road trips was always the different types of cuisine and foods that we would encounter. Come to think of it, most of my favorite souvenirs from Canada were food related items. 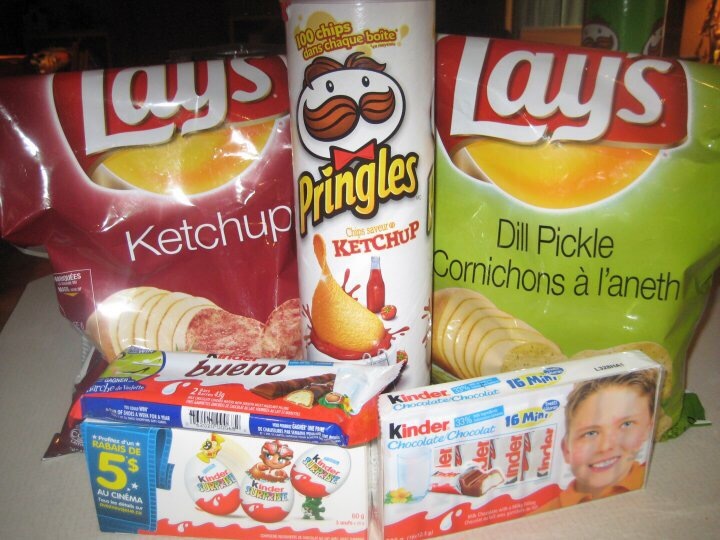 Ketchup flavored chips, maple candies, and any type of Kinder Shokolad (Kinder Eggs). It was like my little treasure trove of snacks and delights. Going to Canada was like going to a parallel universe, where everything was the same, but just slightly different enough to feel foreign and exciting. And now the eastern side of Canada was calling my name, so off we went to the Great White North. But secretly, I was kind of miserable. It was very physically taxing. My back hurt, my legs hurt, my feet were killing me. But I kept a smile on my face and I kept walking. I grimaced every time we left the hotel and walk down hill to the falls because I knew that when we retuned, I was going to have to walk back up it. Not to mention, I felt like a giant albatross around The Captains neck. I was slow and my movement was labored, and I was so out of shape, it was embarrassing. I kept thinking, what if I fell, or I could not continue, and he had to carry me? The thought of him having to pick me up in a 293 pound dead lift was horrifying. So I put on my brave face and soldiered on. And now looking back at every video we took, all you can hear is my heavy breathing in the background, and my gasping for air as I’m trying to have a conversation with him about the wonders before us. So in order to save a little bit of walking and have a chance to rest up, we decided to go on a boat trip that takes you down right up to the base of the waterfall, called the “Maid of the Mist”. They give you a rain poncho because apparently you are going to get wet, and they weren’t kidding. It started off on a good note and by the time that boat ride was over I pictured us being soaked to the bone and laughing hysterically. It was amazing to be that close to something so powerful and feel the infinite majesty of nature. But the frivolity was short-lived. Because wet also means slippery, and there was a point during the tour where I was trying to take a photo, and the boat pitched. I lost my grip and I went down on the deck hard. Apparently there is no graceful way to fall on your face in public. I banged up my knee, and slipped a few more times trying to get up. Thankfully we were wet enough that he couldn’t see my tears and I tried to laugh it off. But being the sweet gentleman that he was, The Captain helped me to my feet, and then sat down and offered me a seat on his lap. Because it made me terribly uncomfortable. I had been lying about my weight for years, and I would have never voluntarily done anything to call attention to that deception. And thus sadly, I felt compelled to politely decline his chivalry based purely on my own harboured insecurities. I know that sounds terribly ridiculous. But at that moment, I felt more comfortable trying to laugh it off and stand unsteadily up on my own two feet, (knowing that I might fall again) than sitting on his lap while trying to awkwardly offset my full weight and feeling the need to apologize for how heavy I was. I thought for sure when he offered, that he must have had no idea what he was getting himself into and would have regretted it almost immediately if I had obliged. It was definitely one of those moments that sticks with you, and cuts deep enough, that you remember it when it becomes a catalyst later on. 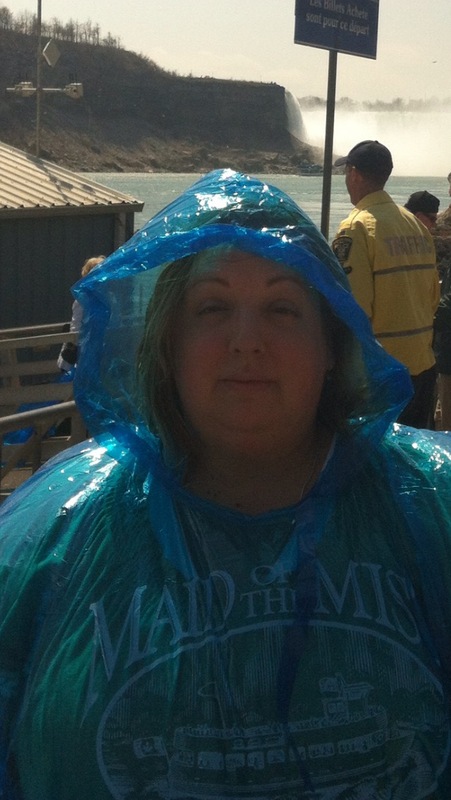 I wanted so badly to be the carefree maid in the mist that day, with nothing holding me back. I wanted to be that girl that didn’t care that she outweighed her significant other. I wanted to be that girl, that felt feminine and strong all at the same time. But in the spring of 2012, standing on a boat in the mist of a thunderous waterfall…I was so not that girl. But I longed for the day when I would not slow him down…or when I would not feel this way anymore. He was very sweet and understanding, and after we emerged from the boat ride dripping wet, we went into the gift shop to have our picture taken in front of a photo of the falls as a souvenir. And since I had hurt my knee on the boat, I limped all the way back up to the main parking lot, and we took a cab back up the hill to our hotel. After everything that went down that weekend, I began to evaluate the way things were going. I began to contemplate where I was, physically, and where I really wanted to be. That was in fact, the last time I ever ate a Tim Hortons donut. Because later that year I joined Weight Watchers and began the arduous task of finally becoming that girl that I had dreamed of being someday. And even though I knew that I did not have to give up donuts forever, I knew enough about myself, to know that they needed to be out of my life, at least for a while. That year, I made a decision to transform myself into that girl, the one that finally got out of her own way, and found the ability to enjoy all the adventures of life without the “but if only…” factor. And the very next time that we practiced our “accidental tourism” a couple of years later, we again decided to go North. It seemed like everything had come full circle and it was time to go out and live that life I had worked so hard for. We again went to Canada, but this time on the western side, back up to a little town that we love, called Whistler. 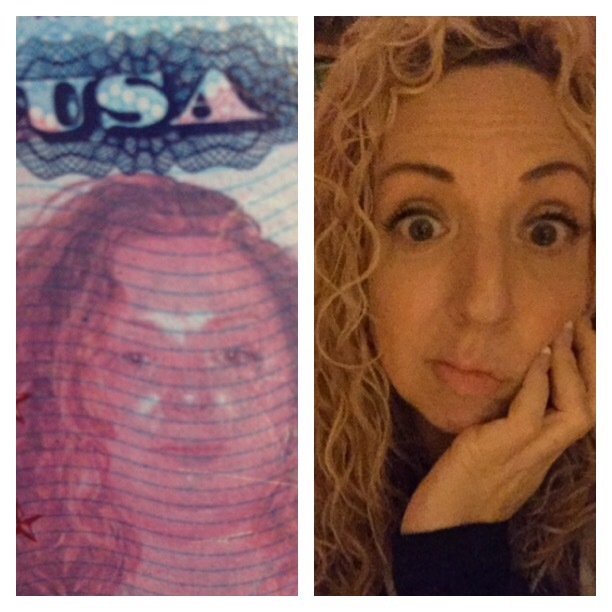 *Point of fact and noteworthy to mention, is that if you lose a large sum of weight, you should not try to cross an international border with your old passport, because sometimes people will look at you strangely and not believe that you are you, and assert that your passport is not legit. 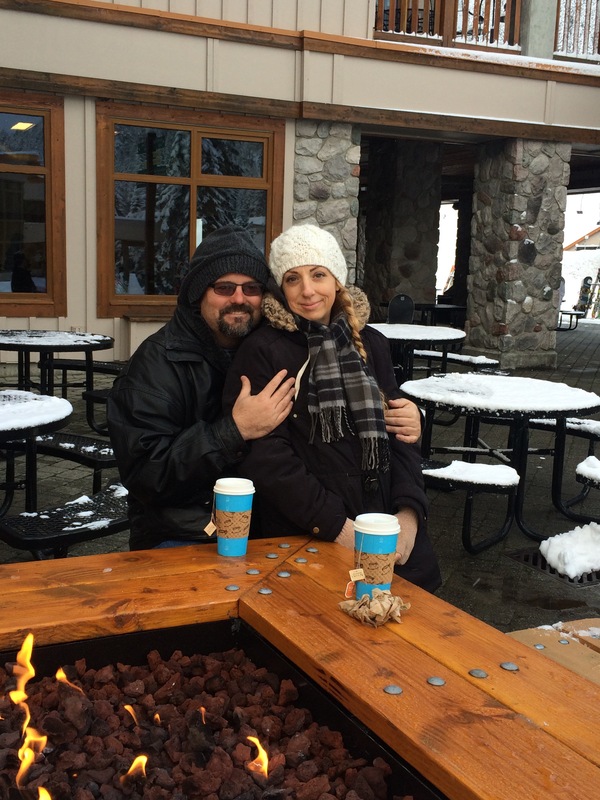 We enjoyed quite a wonderful weekend of shopping, sledding and exploring the village. And on our last day, with the snow clouds overhead, we went out onto the patio to enjoy a crackling fire with a couple of warm beverages. There was a light mist in the air from the tiny wet snowflakes that had begun to fall. And on our way to the seating area, I slipped a bit on a small patch of ice, but grabbed his arm and managed to regain my balance (and save the tea) before we both went down for the count. He quickly sat down as we were both laughing at the near miss, and proceeded to hold out of his hand and offer me a seat on his lap. But this time, I did not hesitate. This time, I took his hand and smiled, and politely accepted his invitation. This time, I was again the maid in the mist, but with nothing holding me back. It was uncovering the new found confidence of a girl who had finally stopped pretending. Thank you for your wonderful stories and for sharing your truth. You are inspiring me and many others. It helps keep me grounded. You were always the maid on the mist to the Captain.